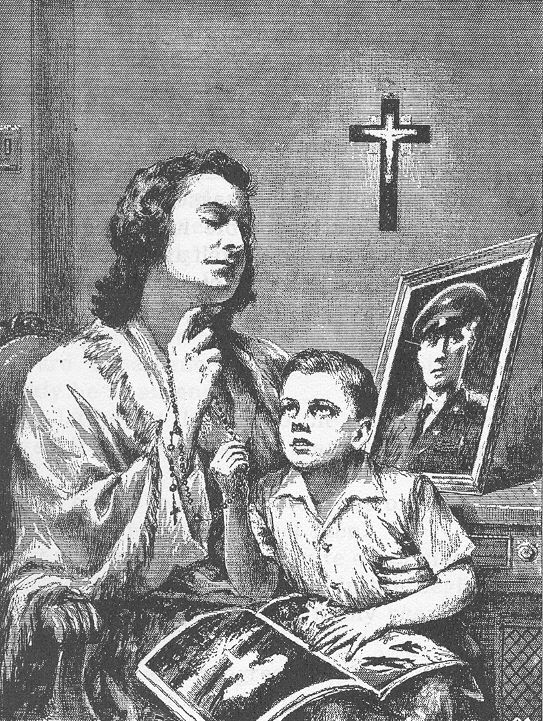 A BEAUTIFUL way of keeping the purity and peace of Christ in the family is to recite the Rosary together. The special power of the family Rosary lies in the old saying: In union there is strength. During the family Rosary Christ prays with us, giving our prayer power it would never have if each member prayed alone. He has said: “Where two or three are gathered together in My Name, I am in the midst of them.” The members of the family also strengthen one another by good example. The father or mother should set a regular time for the recitation of the Rosary. Perhaps after the evening meal would be best for adult families; just before bed time for growing families. Young married people should begin this practice at once after marriage. The blessings of the Holy House of Nazareth –of Jesus, Mary and Joseph-will then be upon them. This is good patriotism. A great America is built upon its families.